Today I thought I would share my travel mug collection! Ever since Daniel and I celebrated our first anniversary in Orlando back in 2012, we have collected a Starbucks mug each time we take a trip together. 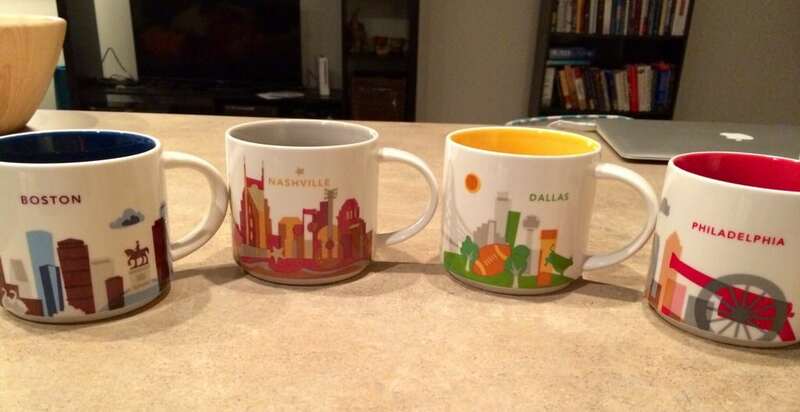 You will notice that there are two types of mugs in the pictures below. We started out by collecting the Global Icon series. 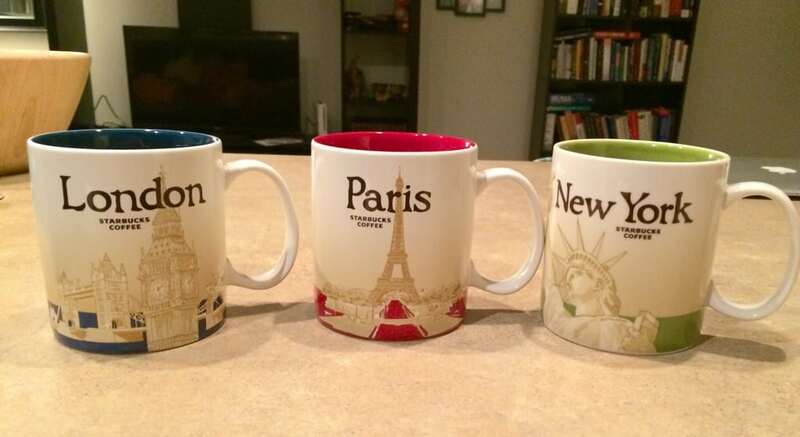 Starbucks has since discontinued this series in the U.S., so we now collect the new You Are Here series. To make it a bit more confusing, the You Are Here series is only in the U.S., and the Global Icon series is still sold overseas. The point of all this is to explain why we have a mix. Anyway, now it’s time for you to join me on a trip down memory lane as I talk about our collection! Orlando – As I mentioned above, this was the first mug in our collection. We picked it up while in Orlando celebrating our first anniversary at Disney World! 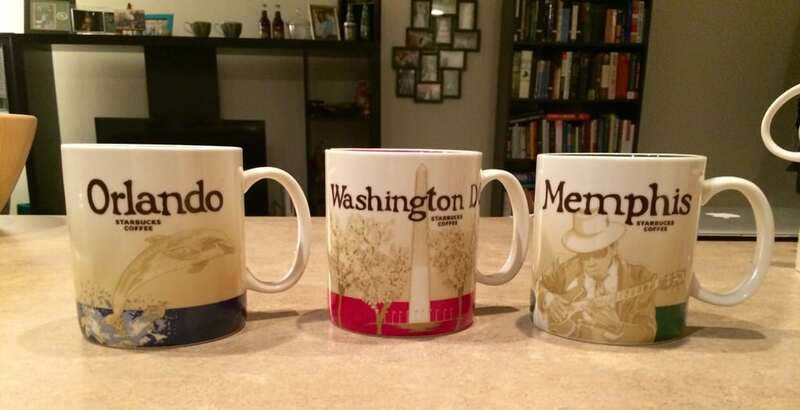 Washington D.C. – Our next mug was picked up in the city we live in – our nation’s capital! This mug is very special. It represents the almost three years we have been living here and exploring the city like tourists together. See some of our D.C. adventures here. Memphis – Up until this past spring, I was traveling to Memphis for work constantly. In fact, I counted once, and I have gone to Memphis twenty times since 2012! I have mixed feelings about this mug because I somewhat associate it with work, but I bought it to remember the time that my company flew my husband out to stay with me to make up for the fact that they had extended my three day trip into a two week trip. While most of the time Daniel was just working in the hotel room and waiting for me to get back to the room at 2am, Daniel and I were able to enjoy one Sunday together doing some sightseeing, so I really enjoy remembering that day when I use this mug. Alaska – In May 2013, Daniel and I took a trip to visit our good friends in Alaska. It was an amazing trip! 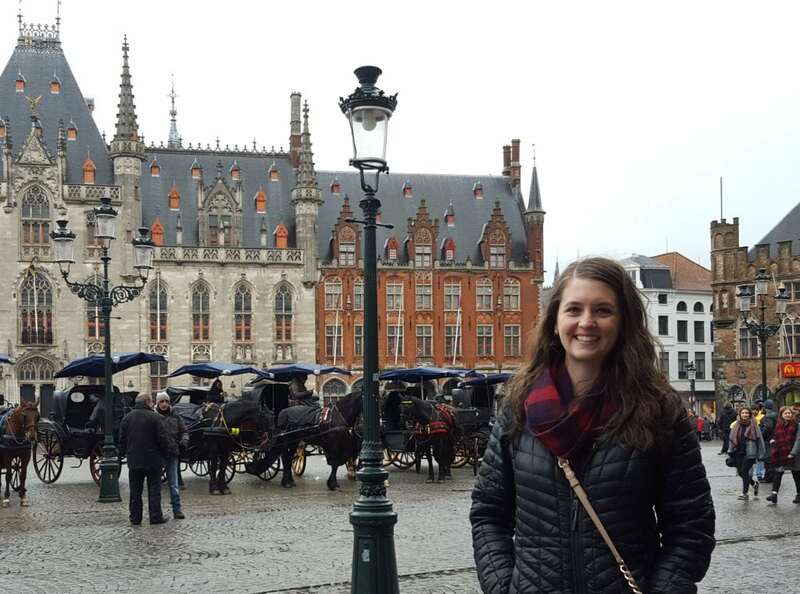 I hope to write a Travel With Me post on it in the near future. Seattle & Pike Place Market – On our way to Alaska, we had a very extended layover in Seattle and fell in love with that city. 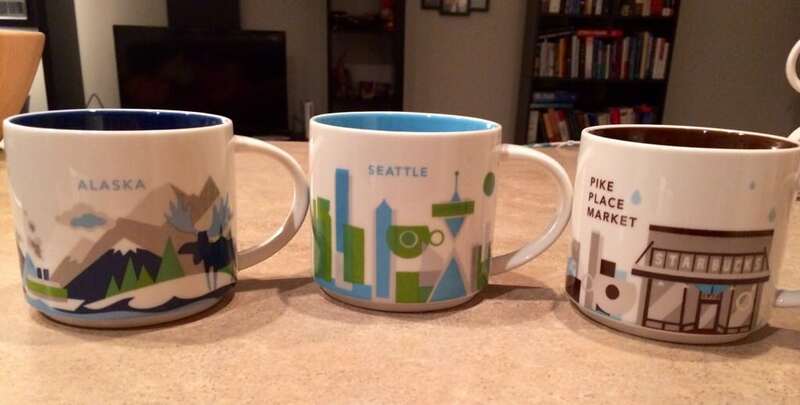 And, of course, we had to visit the original Starbucks and pick up a Pike Place Market mug as well while we were there. Read more about our Seattle adventures here. Boston – In the fall of 2013, we spent a long weekend in New England. We had two days in Boston, one day in Portland, Maine, and one day in Rhode Island. Click here and here for pictures and a recap of this trip. Nashville – We picked up this mug while spending last Thanksgiving with Daniel’s family in Nashville, but it reminds me of two trips. In college, Daniel and I took a road trip with our friends (the couple who currently lives in Alaska) to Tennessee, and we have loved Nashville ever since. Our time there last Thanksgiving was very special as well. In this post, I talk about what we did while we were there during the holiday. Dallas – Both of us grew up in the Dallas/Fort Worth area (Aledo to be exact), so we have spent a bit of time in Dallas over the years. We picked up this mug last December, when we went with Daniel’s parents to visit his aunt who was working in Dallas. Philadelphia – In January we went to Philadelphia with my cousin Josh and his wife Meredith. It was such a fun time exploring this historic city with them. I wrote in detail about this trip here. New York City – In the fall of 2012, we took the train to New York City. That city is just gorgeous in the fall! We saw Wicked, explored Central Park, woke up early to peek in at Good Morning America, and met up with a couple of great friends. We are hoping to go back to NYC this winter, so I plan to do a two-part trip recap after that to show glimpses of the city both in the fall and also around the holidays. Virginia – This mug was given to me as a birthday gift this year. To me, it represents our time living in Northern Virginia as well as our trip to the Shenandoah National Park to drive Skyline Drive in the fall of 2013. I wrote about that trip here. North Carolina – Just two weekends ago, we went to North Carolina to visit Josh and Meredith. 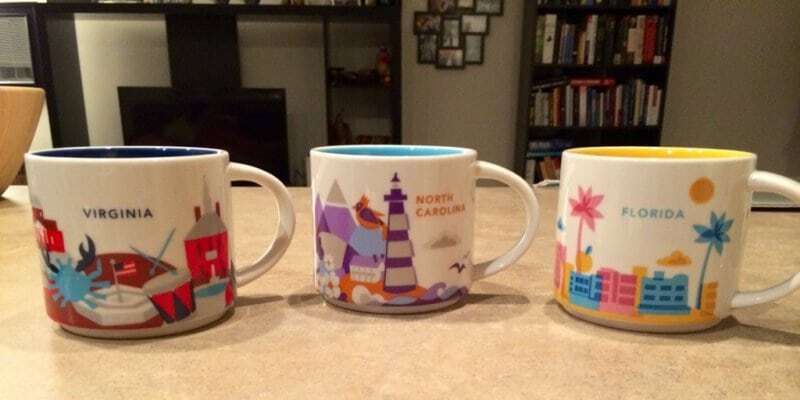 It was our second time to visit them, so we decided to pick up a North Carolina mug to remember all of the fun we have had with them. Florida – We picked up our 16th and most recent mug this past weekend when we visited Daniel’s grandma in St. Petersburg, Florida. It was our second time to go there together. I hope that you enjoyed a peek at our collection! As you can see, Daniel and I make travel a priority right now in our lives. I hope that our collection will continue to grow!